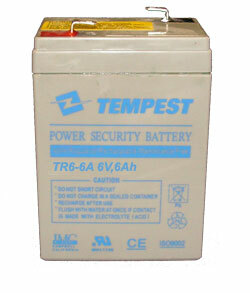 TR6-6A Tempest AGM, Valve Regulated, Maintenance Free, Sealed Lead Acid Rechargeable Battery - 6V 6Ah (20 hour rate)You may also use the batteries listed below for the same application. 6 volt, 6 Ah for use in Alarms Systems, Medical Devices, UPS Systems and general purposes. Length:3.30", Width:1.89", Height 3.94 (including terminals):4.13", F1 terminals(.187"), Approx Weight 3 lbs.